The Jitterbug’s double cupped lip, placed at precisely the correct angle, produces the loud, rhythmic, surface-busting sound that is proven to be irresistible to those big fish. 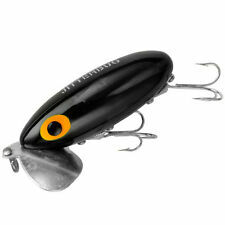 Topwater Fishing Lure - Black. Here's a MOLIX wild Supernato Beetle lure. New in box. Pre Rapala. On ponds, small streams, and protected near-shore areas of larger waters, nothing can beat a Rebel® Crickhopper™. Twitch it on top to imitate real life, or run it down 2 or 3 feet to force a follower to commit. Rendered from re-purposed wine corks, these top water poppers are hand cut, shaped and painted by a Vermont couple with deep roots in the fishing community. #13 The Old Crone - she's scrappy, in it to win it and won't back down! DOLPHIN NEW CICADA ,BRIGHT DEEP DARK GREEN , 2 3/8" .GREAT ACTION LURE .! TOP WATER GREAT ACTION LURE ! BRIGHT COLORS WITHRATTLES ! TWO TREBLE # 4 NO RUST SALT WATER HOOKS ! Swamp Frog. The Pop'N Frog also boasts a proven popping/chugging action on the retrieve. The Rebel Pop'N Frog is ideal for lakes, ponds, streams, or anywhere fish eat frogs. Get ready to walk the frog! (Because each lure is Handmade and Hand-Painted, appearance and weights may vary slightly from lure to lure.). Product Features: Lifelike Design, Vividly Hand-Painted, Standard Weedguard, Wild Burst Skirt, Super Sharp Hooks. (Because each lure is Handmade and Hand-Painted, appearance and weights may vary slightly from lure to lure.). Product Features: Vividly Hand-Painted, Standard Weedguard, Wild Burst Skirt, Super Sharp Hooks. 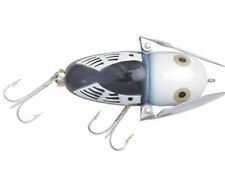 Heddon Crazy Crawler 5/8 oz Fishing Lure. The Heddon Crazy Crawler is a wild acting topwater lure that literally crawls across the surface, creating a trail of splashes as it goes. Hunting & Tactical. Rendered from re-purposed wine corks, these top water poppers are hand cut, shaped and painted by a Vermont couple with deep roots in the fishing community. Each piece is unique in style and design, based on prototypes customized through trial and error to provide the best catching potential! Clothing & Footwear. Check-Out Now! John B Outdoors looks forward to serving you. What happens after I have paid for my item?. We are located in Stuart Florida. Helpful Links. Camping Supplies. Strike King 18PBM-204 Mini Pro-Buzz Buzzbait, 1/8 oz, White NIP!!! The Pop'N Frog also boasts a proven popping/chugging action on the retrieve. The Rebel Pop'N Frog is ideal for lakes, ponds, streams, or anywhere fish eat frogs. Get ready to walk the frog! The Rebel® Frog-R™ is a realistic topwater frog that combines one of a bass' favorite foods with one of bass fishing's most effective techniques: the frog and the walk-the-dog (or in this case, walk-the frog) retrieve. This quick-digging hardbait has been a favorite for more than a quarter of a century, and it's easy to see why. The durable finish, quality components, and proven fish-catching ability ensure you'll have a blast fishing the Rebel Crawfish for years.